Have you ever tried to start a band and write songs but felt like things just weren't clicking? Are you working on writing new music with other people and don't know what to do? Anyone who has written music with anyone else has experienced the many struggles of walking into the unknown territory of songwriting. How do you mesh with new people? How do you come to agreement when there are differences of taste? Where do you even start? There are many ways to write songs with a band in an effective manner. That said, when working with others it's best to not only be effective, but efficient as well. There is a lot to consider outside of just the music. If you are forming a band and everyone is new to each other, it is best to get things moving quickly. People are not completely confident that this is worth the time until there are results, so it's good to get something written to work with. If there is no music than it's not really a band yet. Moving quickly in this area will also give you a better idea of whether or not it is the right thing for you. You will see how people work in the writing process and how they interact within the group setting. Being a perfectionist can come later if necessary, but in the beginning that will hinder your progress as you and your band start writing songs together. When writing songs with your band, getting started is often the hardest part. Like an artist looking at a blank canvas, it is intimidating. Let’s look at it differently. In the beginning, you have very few or no boundaries or stipulations. You can go wherever you want to. You most likely and should have a general idea of genre you want to write in. Don't specify too much at this point. Start writing songs now and narrow it down as you go. Everyone has their own style in writing and playing music. You know yours best, so just start writing in your style. Whatever comes most naturally will come out faster. They might not like it, so you adjust. This is where humble communication is a must. Egos will undermine everything the group is trying to do. As you write songs with your band, stay open minded, listen, and do not get offended if people don't like what you wrote. It will happen. It will happen a lot. Go in prepared to be rejected. Be OK with it. Anything you write that isn't accepted by the group you can save for something else. A different band, solo material, or maybe they will like it more in a couple months. You never know. This approach is much better than fighting or getting bitter at each other. If you want something to last there must be a willingness to accept each other’s opinions and not force opinions on each other during the songwriting process. How To Write A Song With A Band Step #2: Keep it simple. If you intend to write simple music then this will not be a problem. If you want to write complex and technical music then this will seem counter productive at first, but it works. The basis of every song is simple. The basis of music is simple. Complexity can be built on a strong foundation. You have to start somewhere. Let the others know you are setting things up and are going to add to it. Here are some options to get you started writing a simple song idea with your band. Choose a key and pick 2 - 4 chords to work with. Use a prewritten guitar riff or chord progression you or someone else has. You can even start with a drum beat and put a simple riff or chord progression over it. These are all simple and will give the song some life. Once there are two people who can see the potential in what you wrote, then keep it and write the next part. Not everyone has to feel like it's the best thing ever at first. There will be people who can't envision a song when it's so barren. Keep going and it will grow. How To Write A Song With A Band Step #3: Move to the next part. The first riff doesn't necessarily have to come first in the song. It might fit better as a bridge or chorus. I often write backwards. The part I write first often ends up at the end of the song. You can switch things around later on. Play the riff or progression four times and call it a verse. Moving to a chorus, bridge, or whatever is next for you shouldn't be a drastic change. Anything can be rewritten later on of course, but when things are similar and noticeably different, then it will feel more natural to most people. Remember we are just getting things moving forward which is better than being stagnant. If anything you will learn what you don't want to do. So, use a chord or two from the verse and change out one or two of them. If it's more of a riff than a chord progression try moving to a chord progression. You can also use the same riff, but change up a couple notes and the rhythm. This can have a great result if done right. You may find as you go that the second part is much better than the first and you don't even like the first anymore. Ditch it. The second replaces the first. Now write a new second part. You see, if you didn't write that first part, then you might not have written the second part. 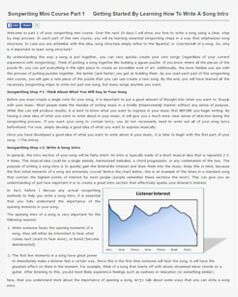 How To Write A Song With A Band Step #4: Write The melody. Now you have written two parts of the song with your band. Verse and chorus or riff 1 and riff 2. It's time to add some depth. This should make things sound full and fresh. You can always write a melody first, but in this example we are starting from a more basic standpoint. The chords lay a foundation to build a melody on. If you have a singer this is a good point to let him or her enter into the writing process and compliment what was written. It's good to get the singer involved quickly since the song carries the message of the lyrics. It will also keep the singer from being bored. If there is a typical band set up the singer is usually waiting around for everyone else to write a bunch of stuff first. If you don't have a singer this is where a melody can be played on a guitar, piano, etc. The melody of course should be moving around a little more than the chords, but you can reverse those. Have a very simple lead over a more moving guitar riff. Contrast can be very complimentary. Now you have enough material for a whole song. What? A whole song? Yes. A lot of great songs are that simple. It could always be an intro song to a live performance or album. The purpose is to have something to work with and to have everyone feel like the songwriting process can be exciting and productive. I would recommend to keep working with it so you will have one whole song under your belt. Do this a couple more times. Having three or four starts will help the group figure out what they like and don't like. Some songs might not last. You don't want to spend a whole month working on one song and then realize you want to go in a totally different direction. At the start of a band this can be devastating. Ryan Duke is a musician, songwriter, and teaches guitar lessons in Seattle . For more help to improve your guitar playing click the link to download the free e-book "5 Steps to Take Your Guitar Playing to the Next Level". His music is a unique breed of avant-garde progressive metal known as Fortis Amor. In teaching and songwriting he seeks to deliver a positive message to encourage fellow musicians and students. Bring more creativity to your band by getting songwriting ideas .